Ladytron are an electronic band formed in 1999 in Liverpool, England. The group is composed of Helen Marnie (lead vocals, synthesizers), Mira Aroyo (vocals, synthesizers), Daniel Hunt (synthesizers, guitar) and Reuben Wu (synthesizers). Their sound is usually described as electropop mixed with new wave and shoegaze influences. They took their name from the song "Ladytron" by Roxy Music. According to Brian Eno, once a Roxy Music member, Ladytron are "the best of English pop music". Liverpool-based producers and DJs Daniel Hunt and Reuben Wu met in the 1990s. Hunt was the founder of the indie record label Invicta Hi-Fi and of a nightclub. Wu trained in Industrial Design at Sheffield Hallam University and graduated in 1997. He became an industrial designer at Team Consulting Limited until 2002. Using the moniker Ladytron, Hunt and Wu recorded the debut single "He Took Her to a Movie" with the guest vocalist Lisa Eriksson (who later formed the band Techno Squirrels). "He Took Her to a Movie" was released in 1999 and became NME Single of the Week. In the summer of 1999, Hunt and Wu met Helen Marnie (born in 1978 in Glasgow, Scotland) and Mira Aroyo (born in 1977 in Sofia, Bulgaria). Marnie and Aroyo joined Ladytron as vocalists and keyboard players. Marnie studied music at the University of Liverpool where she received a Bachelor of Arts in pop music in 1999. Aroyo was a postgraduate research geneticist in the Oxford University's Biochemistry department. In 1999, the band issued the EP Miss Black and Her Friends in Japan only, followed by Mu-Tron EP in 2000. All the songs from these EPs, except "Miss Black", were later included on their first full-length album. In 2001, Ladytron released their critically acclaimed debut album, 604 on Emperor Norton/Invicta Hi-Fi. The album has been written mostly by Daniel Hunt and co-produced by him and Lance Thomas. Four singles supported the album: "He Took Her to a Movie", "Playgirl", "Commodore Rock", and "The Way That I Found You". Also in 2001, Ladytron covered The Human League' song "Open Your Heart" for the compilation album Reproductions: Songs of The Human League. Until 2004, the band wore uniforms on stage. Daniel Hunt stated in 2001 that their uniforms were inspired by the SF movie The Andromeda Strain. In an interview from 2002, Hunt also said that the meaning of 604 album title is the area code for British Columbia. In 17 September 2002, Ladytron released their sophomore album Light & Magic on Emperor Norton/Telstar. This album was co-produced by the band and Mickey Petralia in Los Angeles. Light & Magic featured a darker sound than their debut. The album spawned three underground hits, "Seventeen", "Evil", and "Blue Jeans". They toured over a year to support this album. In 7 October 2003, they issued the mix compilation Softcore Jukebox. The compilation includes songs of other artists selected by the band and also two of their own songs: the single remix of "Blue Jeans" renamed "Blue Jeans 2.0" and the cover "Oops Oh My" by Tweet. The cover art appears to be a homage to Roxy Music's Country Life. 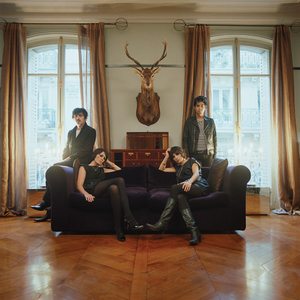 In 3 October 2005, Ladytron released their third studio album Witching Hour on Island. This album was co-produced by the band and Jim Abbiss. Witching Hour featured live drums and guitars mixed with their trademark sound. This album was very well received by critics and fans. It was supported by the singles "Sugar" and "Destroy Everything You Touch". The single "Destroy Everything You Touch" became the band's signature song and it's performed live on almost every concert. Their third album was followed in 2006 by Extended Play, a two-disc EP CD/DVD compilation that features exclusive unreleased remixes and UK B-sides, as well as a 35-minute bonus DVD. In the same year Ladytron recorded The Harmonium Sessions, which contained four reworked songs from their third studio album. The group took to the road on the strength of their massive cult following, booking sold-out tours across North America and Europe, and playing for capacity crowds in China and Latin America. Without any real label support, Ladytron toured exhaustively over the next two years, performing for over 4,000 people in Bogota, Columbia and opening for Nine Inch Nails in early 2007 at the request of Trent Reznor. In meantime, Wu, Hunt and Aroyo also played DJ sets around the world. Along their career, Ladytron have produced remixes for many artists, including Dave Gahan, Goldfrapp, Placebo, Blondie, Bloc Party, Kings of Convenience, Gang of Four, She Wants Revenge, Soulwax, Nine Inch Nails, Simian, Indochine and Apoptygma Berzerk. In 2 June 2008, the group issued on Nettwerk their fourth album, Velocifero. The album was recorded in Paris, with the band handling production duties with Alessandro Cortini (Modwheelmood, Nine Inch Nails, SONOIO) and Vicarious Bliss (Justice, DJ Mehdi). Their sound evolved to an even more organic sound and harsher beats. The band states that "velocifero" literally means "bringer of speed" and is also the name of a classic retro styled scooter. The album spawned three singles, "Ghosts", "Runaway" and "Tomorrow". In 2009, Ladytron toured North America with The Faint (co-headline tour), and performed two special shows with Brian Eno at the Sydney Opera House in the summer. They also announced that they will be the opening act for Depeche Mode on few concerts in Eastern Europe, but these concerts were cancelled due to Dave Gahan's illness. Also in 2009, the band issued their first live album entitled Live at London Astoria 16.07.08, followed by the remix compilations 604 (Remixed and Rare), Light & Magic (Remixed and Rare), Witching Hour (Remixed and Rare) and Velocifero (Remixed and Rare). In the same year, the band wrote and produced two songs for Christina Aguilera's album Bionic: "Birds of Prey" and "Little Dreamer". The soundtrack of the video game FIFA 11 featured a new Ladytron song, "Ace of Hz", which was released as digital single on 30 November 2010. In 11 January 2011, the band issued the digital EP Ace of Hz, which includes the album mix plus 5 remixes. In 28 March 2011, Ladytron released the compilation Best of 00-10 on Nettwerk. It featured 17 tracks on standard edition and 33 tracks on deluxe edition (plus a 80 pages booklet). They also issued the remix compilation Best of Remixes and the iTunes video compilation Best of 00-10 Videos. In 12 September 2011, they released the fifth studio album, Gravity the Seducer, on Nettwerk. The album was recorded in Kent's countryside and it was produced by the band and Barny Barnicott (Arctic Monkeys, Kasabian, Editors). Daniel Hunt said "Gravity the Seducer is more of a jump than the last album was, more ethereal and melodic, a touch more abstract in places than we've gone before, baroque 'n' roll". Gravity the Seducer has been preceded by the single "White Elephant", issued on 17 May 2011. The band premiered the song "Ambulances", in 16 June 2011. It was followed by the single "Mirage" in 8 August 2011. On 24 May 2012, Daniel Hunt announced that he will produce Helen Marnie' solo album in August in Iceland. The album is due March 2013.